The snow is gone. Store the winter clothes. It’s April! Spring! Sun and warmth! At County Lines, we’re celebrating. Most people think weddings are primarily the bride’s show. Basically, the future husband is expected to show up, not to embarrass, to look handsome. But our editor Jo Anne Durako takes a somewhat more expansive view in “The Groom’s Side.” From advice on proposing, to the couple’s Bermuda mini-moon, she was a sounding board for her son through the steps. And everyone made it! Whew! Heritage and horses, family and fox hunting, conserved space and country life: life is good at “Fairyhouse,” named after a famous Irish racecourse. Laurel Anderson takes a tour of this classic 58+ acre farm and perfectly maintained 18th-century farmhouse with renovations and additions by John Milner. Basketball, swimming, hockey, wrestling, track: area private schools keep on winning. And their students are accepted to top college programs, enjoying “Sweet Success at Independent Schools.” For parents of younger kids, we have a Summer Camp Guide. “Dirty Rotten Scoundrels” opens at The Resident Theatre Company in West Chester at the end of March. Very funny. In Theater Spotlight, Rachael Lutcher tells us about the play. Check out our “Being Well” column, where Dr. Catherine Foote tells us about braces for adults. In “Worth Knowing,” MacElree Harvey attorney Ashley Stitzer tells us about the other side of prenup agreements—the postnup. 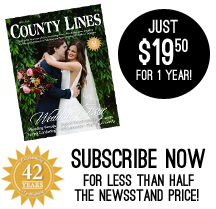 We hope you’ll to subscribe to County Lines. You can do it online or call 610-918-9300. Or you can get an electronic copy at Issuu.com. For single print issues, try Wellington Square Bookshop, Wegmans, Paoli News, Bryn Mawr News, Berwyn News or another newsstand. Visiting an advertiser is a great—and free—way to get one: click Get A Copy at our website, www.countylinesmagazine.com. You can also get our free on-line newsletters by signing up at the website. Jo Anne Durako, our editor, thought she’d taught her son all his life lessons, but there were more. They hadn’t talked about getting married in the 21st century. The proposal, ring, groomsmen, rehearsal dinner, farewell brunch, gift to the bride, honeymoon, thank-you notes, etc.—all are on the groom’s list. Learn more in the story. Mercedes Thomas, our assistant editor, is from Lancaster County, but she’s not Amish and didn’t get around in a horse and buggy. Lancaster, she tells us, is surprisingly diverse, from rolling country hills, to busy shopping outlets, to an increasingly sophisticated city at the county’s center. She’ll take you on a tour of the theaters, amusement parks, breweries and, of course, the county’s distinctive mud sales. Finally, she’ll wind up in Lancaster City, for its galleries, artisans, shops and dining. How you prepare your garden in spring sets the tone for the rest of the season, so it’s worth spending some time now planning for a bountiful summer garden. Lisa Roper of Chanticleer offers some ideas of how to tend your garden—from mulching to planting to dividing to planning. By nature a garden is ever evolving, but by striving to refine the design, over time the garden can be transformed into a more successful space. We hope you’ll to subscribe to County Lines. You can do it online or call 610-918-9300. Or you can get an electronic copy at Issuu.com. For single issues, try Wellington Square Bookshop, Wegmans, Paoli News, Bryn Mawr News, Berwyn News or another newsstand. Visiting an advertiser is a great—and free—way to get one: click Get A Copy at our website, www.countylinesmagazine.com. 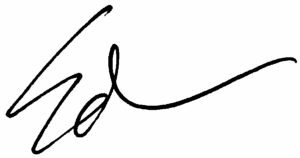 You can also get our free online publishers letter and newsletters by signing up at the website.